Sitting anxiously in front of the computer — learning the benefits of Java, may not help you to live your dream. 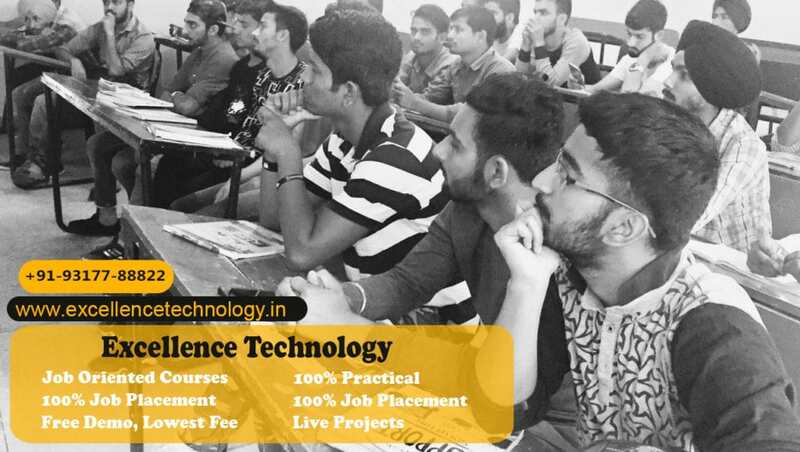 Visit excellence technology the finest java training in Chandigarh that assures you admiring career growth by the end of your 6 months and 6 weeks industrial training. We are top reputed ISO 9001:2015 Certified training institute in Chandigarh and have the best faculty member with the latest module to give you training with expertise. Your effort helps you to find success and our approach is to put them in the right manner that reduces your distance to success. Each time when you reach out to us we provide you complete, reliable as well as trust worthy aspect for java training in Chandigarh. What do you find at Excellence Technology for Best Java Training in Chandigarh? Develop mobile application, Games, antivirus , and websites. With a state-of-the-art infrastructure and skills development for different like software, networking, automation, digital marketing, MBA and many more. The best learning environment for our students and skills development. 100% Practical training on real-time projects. With your hard pursuance is all that you need to come up with and the at Excellence Technology the best java training institute in Chandigarh make sure that you accomplish in your dream goal. How to Start with Java? Java Course Fee in Chandigarh. All Courses Have Validity of 2 years. It ensures to develop software on one and deploy it on virtually any other platform. Either run in a web browser or access available web services at the time creating the program. For mobile phone and other embedded devices create the powerful application. Applications like online stores, polls, image galleries, form processing and more server-side can be created. Our java training in Chandigarh is designed according to the industry requirements. we update our syllabus as per demand of trends.we will teach you those things on which java development is going on now days.our daily assignment based training and 100% practical approach will take you to the dream job in java.